Postcard of the Fayette County Court House - Lexington, Ky. I sure hope this letter brightens your day. 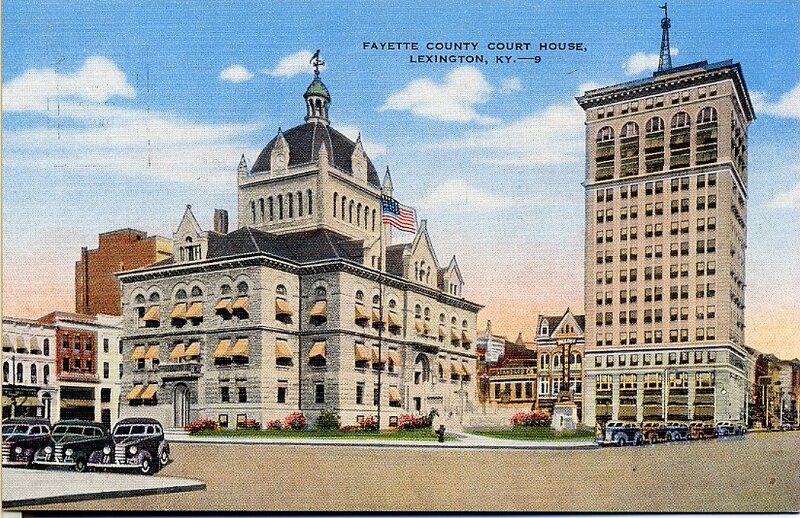 I was at an antique store here and found this old circa 1939 picture of your beautiful courthouse. How the card got to Arizona we'll never know. It's an old time classic, for sure. I thought to myself, by golly, I'd send it home where it can be appreciated. Our heritage is valuable to all of us. Lots of changes over the years, I'm sure. Enlarged it will make quite a display. Well, I gave 6.00 for it so if you want it for 7.00 or 8.00 or so why that's sure o.k. Throw in a little postage if you want, too. And my wife says if I hear from you I'll have to take her to lunch. I am eighty-four years old and still going strong. I like to call my littly hobby, "A re-distribution of happiness." Our world sure needs it. Thank you, and Godspeed in your work. Have a wonderful and progressive year. PS: Send along a little about your place today if you want. I enjoy souvenirs, too, if it's o.k. with you. I chose you at random off the net. It was a delight to receive and read Mr. Joerg's letter. A Google search reveals that he is a retired insurance salesman and that he sends out two or three of these postcards a month to recipients across the country. I hope that Mr. Joerg enjoys learning a bit more about these two terrific buildings. His concept for the "re-distribution of happiness" is fabulous and we should all attempt to share joy in our own way! Thanks, Lowell Joerg!